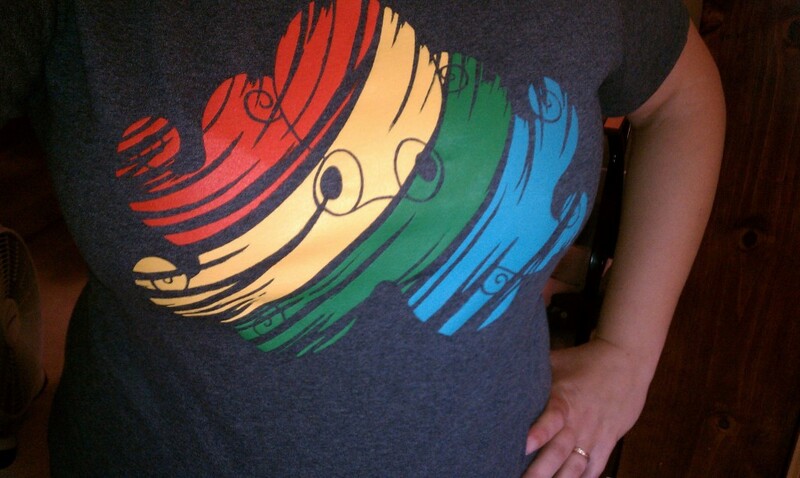 I have short-sleeved t-shirts of my Rainbow Octopus artwork! Sizes S-XXL are available. Head over to Etsy for details, including more photos. 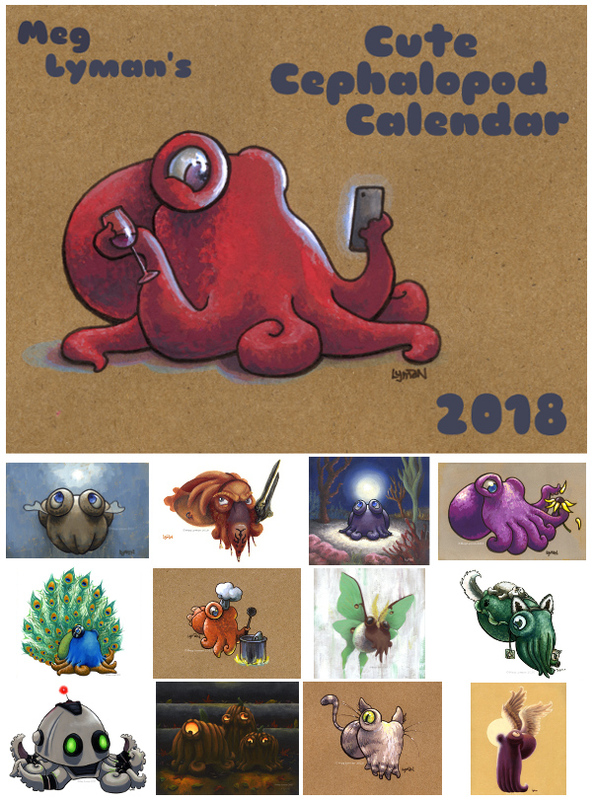 Since 2013 is upon us, calendars are now available for a discount – only $14, including shipping within the US. I accept Paypal and credit cards. Click the link below to get started! 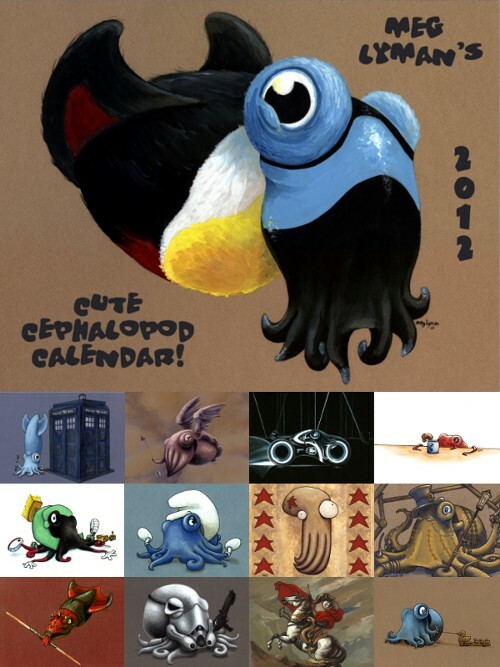 The 2013 version of the Cute Cephalopod Calendars are here! For $20 plus $2 shipping*, you get a whole 12 months of nerdy 8-armed cuteness, including Star Wars, the Avengers, Dr. Who, and more. If you want one for the holidays, order now, because they go fast. I accept Paypal and credit cards. Click the link below to get started! * shipping outside the US may be a wee bit extra. Also, shipping is only $2 no matter how many calendars you get. I have a second batch of stickers for sale. 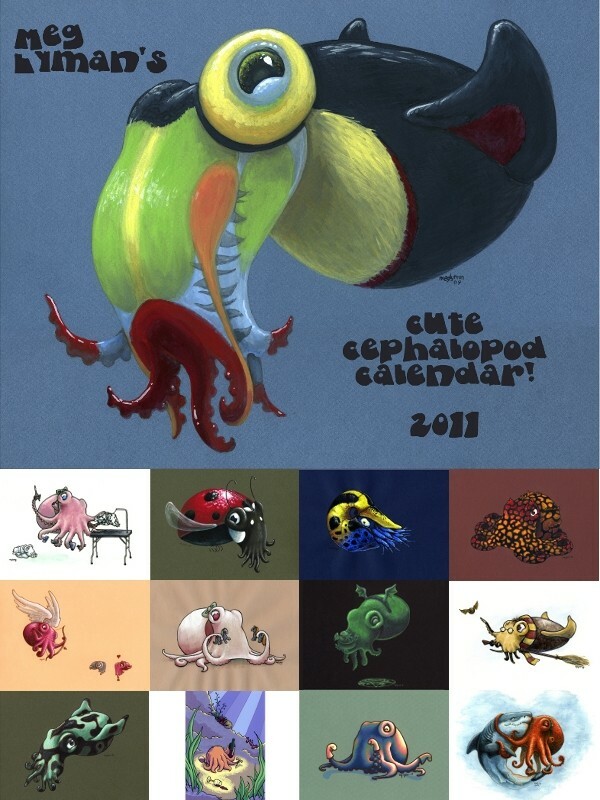 Get a sheet of cute octopus or cute non-cephalopod critters, or one of each. I’ll have them for sale at conventions this summer – if you’re interested in getting some there, let me know so I have enough stock. p.s. sorry about the crappy cell phone photo – it’s just to show the scale. The stickers look great, just like the original arts! 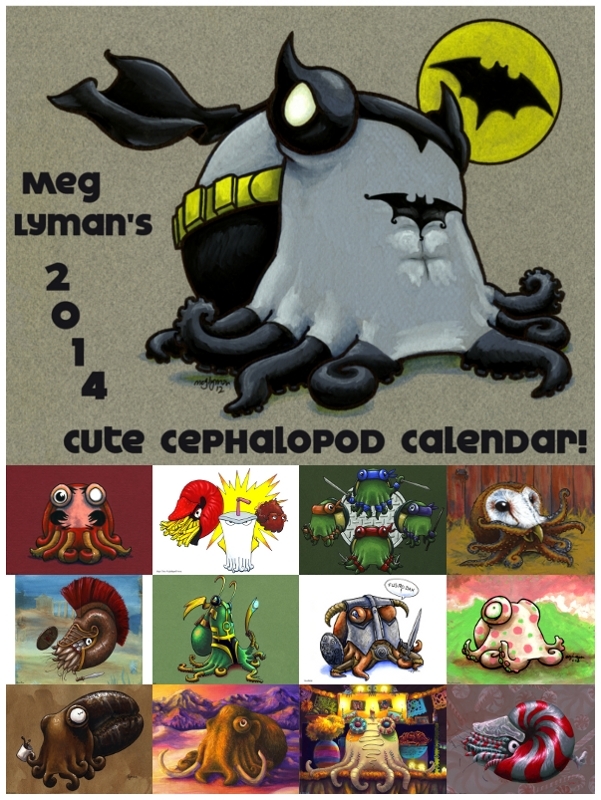 It’s your last chance to buy a Cute Cephalopod Calendar for a loved one this holiday season! Send me an e-mail if you’re interested. 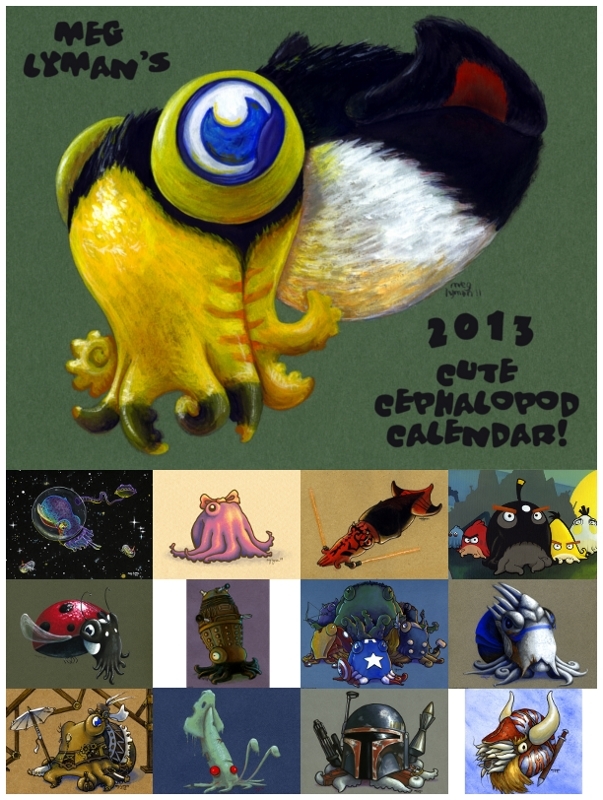 The new version of the Cute Cephalopod Calendars are here! 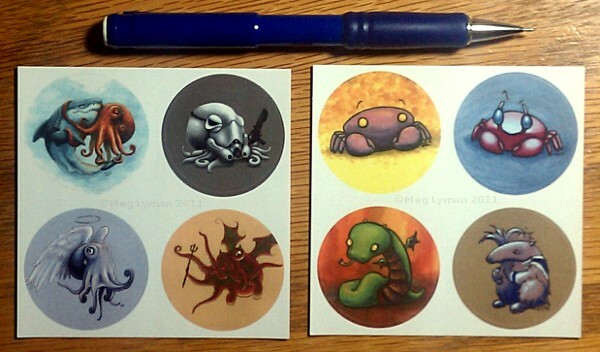 For $20 plus $2 shipping*, you get a whole 12 months of nerdy 8-armed cuteness. If you want one for the holidays, order now, because they go fast. I accept Paypal and credit cards. Click the link below to get started! * shipping outside the US may be a wee bit extra. Also, shipping is only $2 no matter how many calendars you get! At conventions, I sometimes get requests for fan art. I am happy to do it, because it’s fun and inspiring. 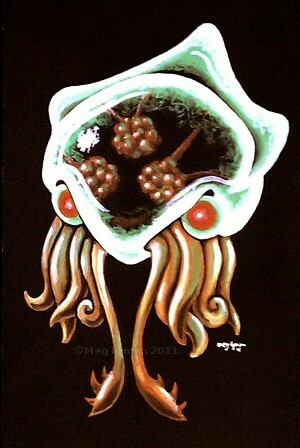 However, when I do, it’s always a cephalopod version of a well-known character, like a smurf or a superhero or the Metroid brain-eater thing (see above, done at a con, hence the crappy photo). I give it arms with suckers and make it “mine.” Also, it’s not my main body of work. I was at Anime Weekend Atlanta this weekend, and it was a fairly good con. Not like prior years, but you know, the economy. The thing that bugs me about these cons (anime in particular) is that fan art is not only rampant and unoriginal, but it is exactly what the masses want. It is depressing to sit next to a table where someone is selling their “version” of some wildly popular character, which is really just that character in a new pose or with a slightly different shape – and that table is making far more sales than any table that sells original ideas. The fans love it. I don’t fault them for that, but the artists selling this stuff are at best uninspired, boring, and not growing as artists. Why should they, when they can sell others’ ideas? It is their loss, but it is sad nonetheless. Opinions? p.s. I painted that black background and it is nearly flawlessly smooth. I had always heard of gouache’s magical matte finish, but had never achieved it… until now! Woot! Ready for your purchasing pleasure! Makes a great gift that keeps on giving. $20 gets you 12 months of cute squishiness, delivered to your door. If interested, comment here or send me an e-mail. I can accept Paypal or credit cards. Happy early Holidays!